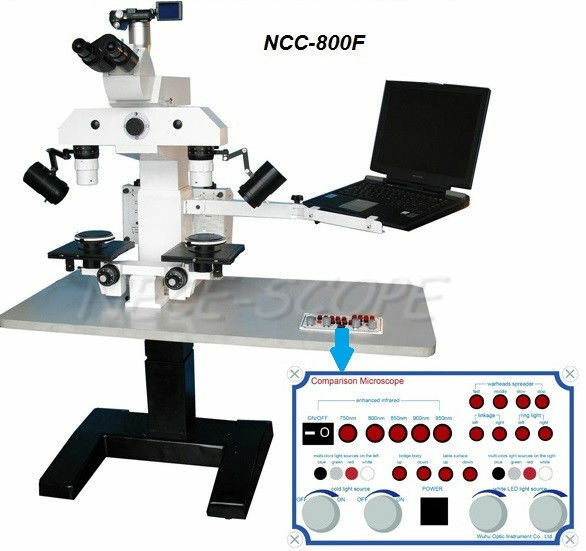 NCC-800F Digital comparison microscope adopts two eyepieces synchronized with CCD, users can view images both left and right objects, and make macro comparison on two or more objects to obtain the aim of validation. NCC-800F is a high level Digital Comparison Microscope, it has a built-in digital image analysis system and an adjustable operation table, it is basically used for forensic science and police departments. It is also provided to these departments such as police training schools, banks, tax, print, coinage, archaeology and etc for marks analysis and notes comparison. The LED light has R, G, B color, so as to meet different requirements. 2. Built-in digital CCD camera system—— synchronized with manual observation. Built-in digital color / black and white CCD camera system——provide for infrared comparison use. IR filter passing waves length: 750, 800, 850, 900, 950 nm five fields, through electric control. This product is an ideal tool for public security to make forensic check (on comparing bullets, cartridge shells, tool marks, fingerprints, seals, texts, coins, printings etc...), which is also widely used in electronics, biology, printing, coins making and other industrial quality controls.